Research can help zoos evaluate animal welfare. 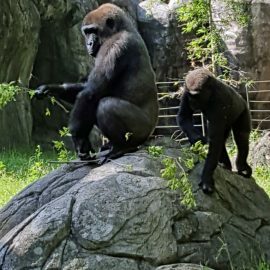 Kelly and Ashley, two undergraduate students from North Carolina State University, are conducting a study where they observe gorilla behavior and assess their enrichment to do just that. What’s enrichment? It is anything given to an animal in order to enhance its environment and to increase the opportunity for it to behave like it would in the wild. The North Carolina Zoo’s western lowland gorillas receive many enrichment items, like burlap sacks and plastic tree logs. 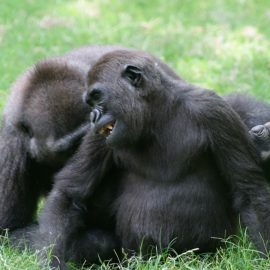 As part of their study, Kelly and Ashley are looking at five items that the gorillas can use, play with, and eat from. These items will either have food or no food in them, so they will determine if the presence of food affects the gorilla’s behavior. 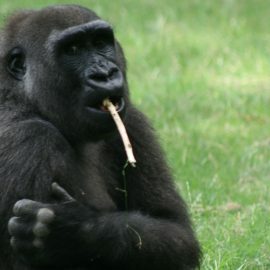 In the wild, gorillas forage for food for the majority of the day, so it is important that the North Carolina Zoo's gorillas move around and look for food as well. This study’s results will aid the NC Zoo in improving the lives of its gorillas and improve overall knowledge of gorilla behavior.